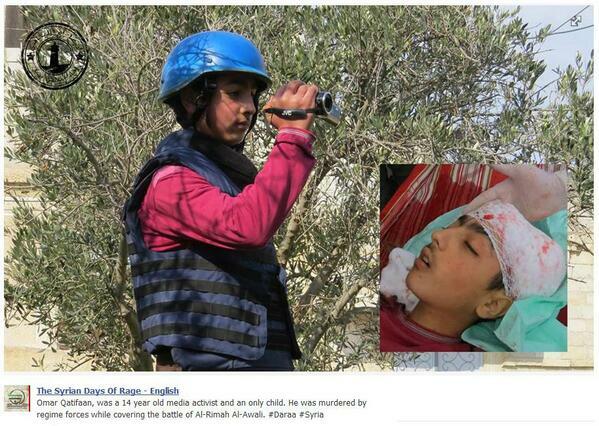 Omar Qatifaan, a 14-year-old media activist, was killed 21 May, 2013 while covering clashes between the Syrian Army and the rebel Free Army in the southern Daraa al-Ballad area of Syria near the border with Jordan. Youth media project Syrian Documents  reported on his death, and Syrian news blog YALLA SOURIYA  called him the “Spirit of Syria”. The conflict in Syria, as well as other Arab Spring uprisings, has seen a rise in citizen journalists reporting from the ground on the ongoing war between the country's pro- and anti-government forces. Many have been detained, tortured, and even killed while trying to bring the story of the revolution  to the world. Children have also paid a terrible price during the conflict, with thousands killed  during the violence so far.